I love Christian historical fiction that takes occurs in places I know. So I jumped at the chance to review Spring for Susannah, the first novel by Catherine Richmond, which takes place near Fargo starting in 1873. My family was immigrating into Dakota Territory only a couple of years later than this, though further south. Booklist says, "Inspired by [folk] lyrics, Richmond arrives on the inspirational fiction scene with a moving debut novel. 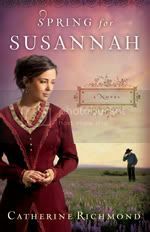 Readers will be filled with hope that Susannah will learn the true meaning of love. Highly recommended where inspiring, romantic historical fiction is in demand." Catherine Richmond was focused on her career as an occupational therapist till a special song planted a story idea in her mind. That idea would ultimately become Spring for Susannah, her first novel. She is also a founder and moderator of Nebraska Novelist critique group and lives in Nebraska with her husband. For more about Catherine, please visit www.catherinerichmond.com. My take: First, I really did enjoy this book. Told primarily from the point of view of Susannah, it also includes portions told by Caleb and some other minor characters. One part I particularly enjoyed was that each chapter started off with a one- or two-line prayer, usually of Caleb's, that served as a chapter title of sorts. The story did tend to be more "romance" than I usually prefer, and that aspect will keep me from handing it to my kids to read. I loved the idea of reading about the very early settlers of the Red River Valley though. This story starts less than two years after Fargo was founded... and includes the first hotel built in Fargo, along with details about Fort Abraham Lincoln out in Mandan. Those touches were fabulous. The aspects of Susannah adjusting to the wide open, treeless plains and the long winters without neighbors were great. The nearest neighbors -- Ivar and Marta -- oh, I wanted them to be a bigger part of the story. I would have loved it more if they had been Swedes instead of Norwegian, but there are more Norwegians in the Fargo area, so that was realistic. As far as the historical aspects go, though, there were a lot of details that did not ring true for me. There ended up being a lot I went and looked up either as I read, or after. Like Susannah talking about the landscape being formed by Lake Agassiz... which wasn't named that until a few years after the story ended. Okay, so a lot of these details did turn out to be accurate or plausible... but enough didn't. And for someone who isn't terribly concerned about little details of North Dakota history, well, it is highly unlikely that this will bother you at all. You can read other people's opinions of Spring for Susannah at the LitFuse Blog Tour page, and find more details on entering a Kindle giveaway! Disclaimer: I received this book through the LitFuse Blog Tour. No other compensation was received. All opinions expressed in this review are my own. Debra, Thank you for sharing about Spring for Susannah on your blog. How wonderful that your family were Dakota pioneers! We had a terrific time camping around Valley City while I did my research - what beautiful country. Good catch on Lake Agassiz - I assumed he'd named the lake when he published his research - I should know better than to assume anything! The change I made intentionally was adding people to Valley City. As far as I could tell only 8 people lived there in 1873 - all of them men! May God bless your day! Cathy -- The Valley City thing was another one I questioned, LOL! I was pretty impressed with the research you had to have done... and my family came about five years later, settling another 50 or so miles south of where this is happening. Swedes, if that isn't obvious from my review!